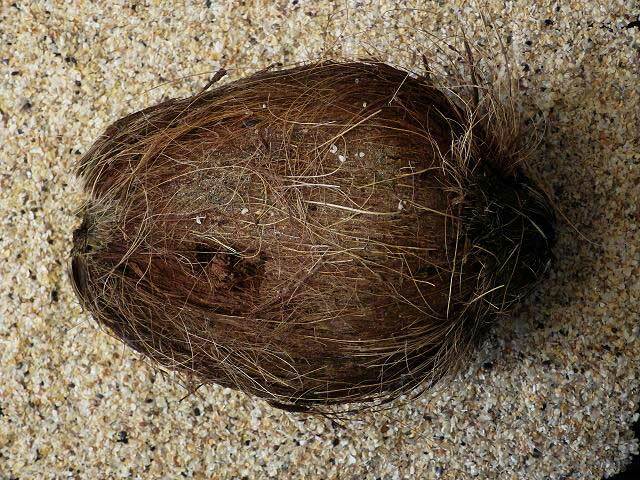 Coconuts (and other flotsam) washed up on Cornish beaches can host exotic ocean travellers all the way from the Caribbean Sea. 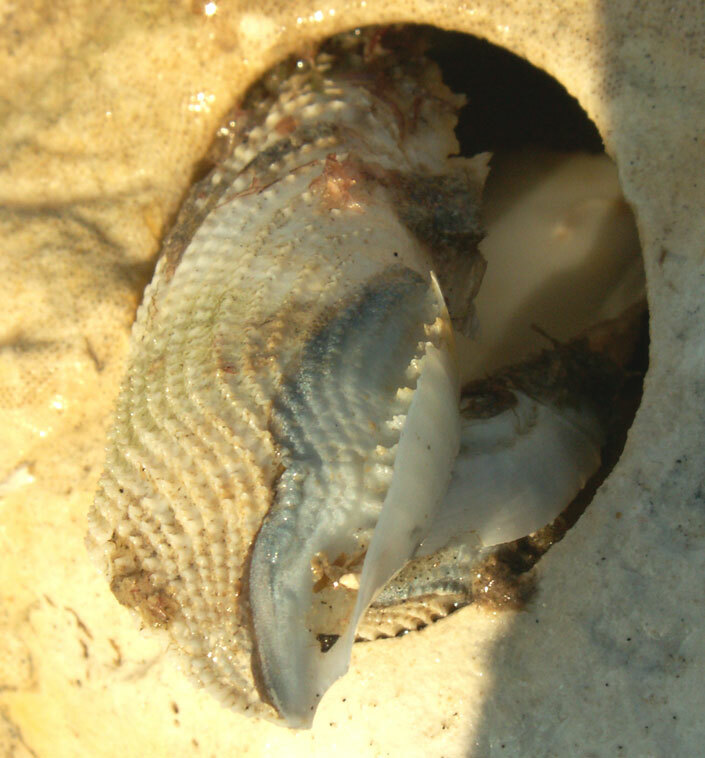 A Coconut discovered on Newquay Beach, north Cornwall, was discovered to be hosting Goose Barnacles, Lepas anatifera, attached to the outer husk, and a species of Martesia piddock that had burrowed into the shell. 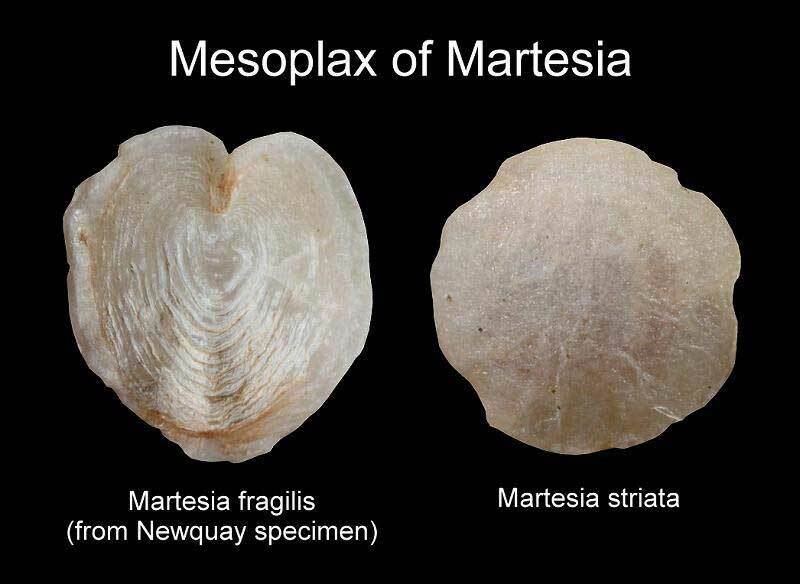 Difference between the two species of Martesia recorded washed up on British shores. 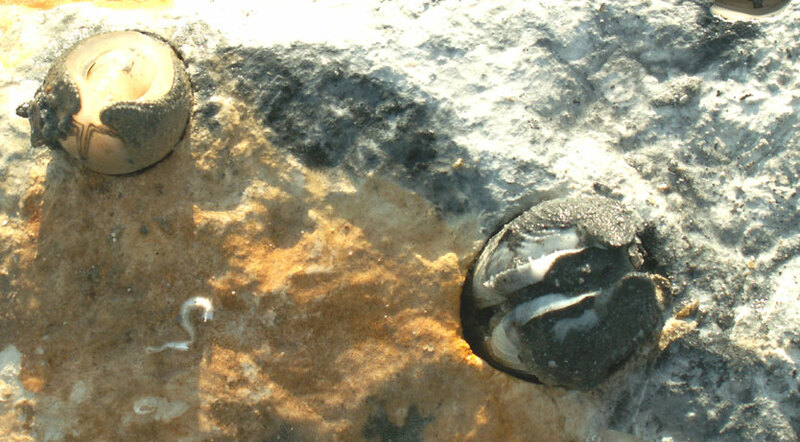 Pholas dactylus is the common species on Sussex shores. 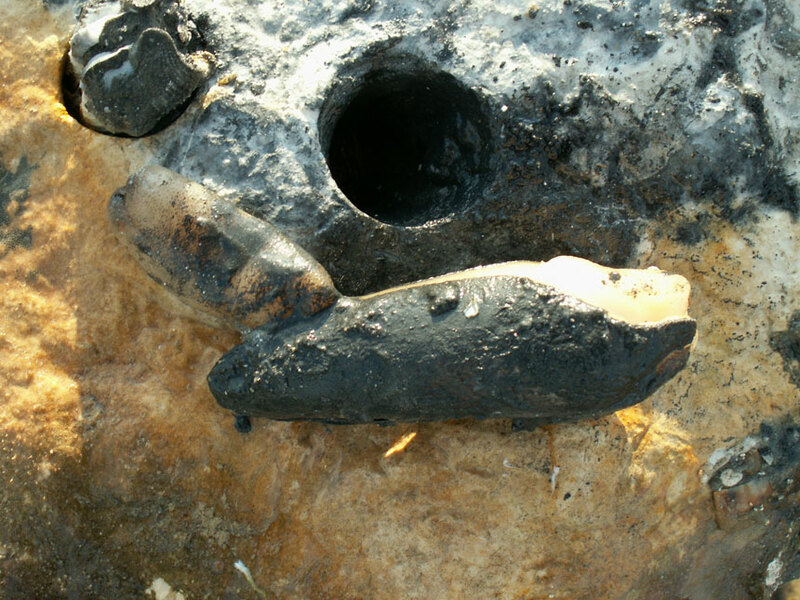 These were on east Worthing beach on 8 September 2006. The ID has not been confirmed at the time of writing. 4 dead piddocks lying on the surface and 3 live ones spotted all with intact shells. No evidence of recent storms or human disturbance. This is the first time that the piddocks have been found like this at Worthing. They were much shorter than the Brighton specimens. I suspect a different species. Length of shell: 55 mm. Top: Barnea parva Bottom: Phola dactylus (juv.) from Worthing. 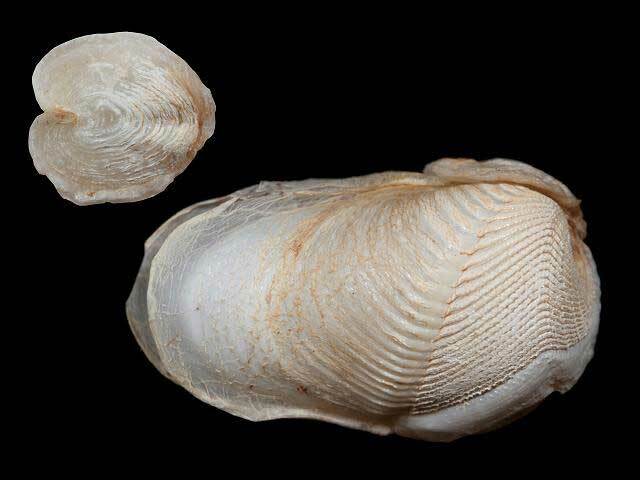 At least three species of piddock have been recorded from the shore at mid-Sussex. Barnea candida is a long oval shape, like an elongate date. It doesn't have the tapered bit at one end. It is very similar in shape to Petricola pholadiformis which is a Venerid. 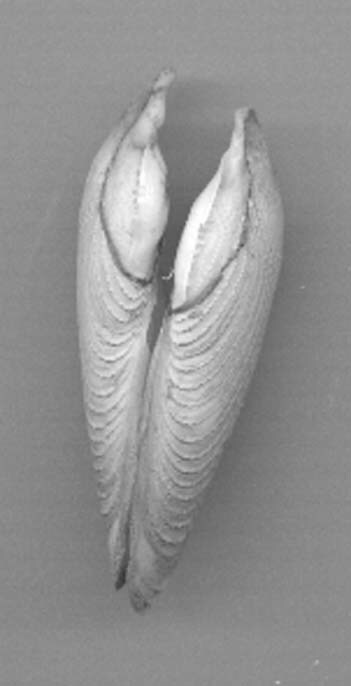 The latter species has a very similar overall appearance but it has a ligament connecting the 2 valves rather than the accessory plates of piddocks. Midway between mid-tide and Chart Datum. 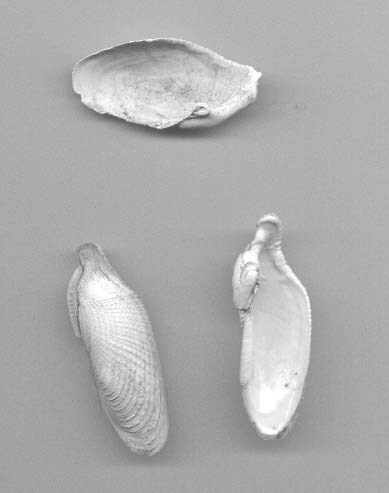 Empty shells in a small (1 sq. metre) are of exposed chalk bedrock between the mussel beds. A few days earlier the weather had been inclement with gale force winds. Seagulls are common as well as small waders and the exposed shells would be quickly preyed upon. All them were broken in half and the pairs of shells could not be instantly matched. (On return home with 11 half shells, none of these could be paired.) However, the 'cardinal tooth' was present in a few shell halves, which means that must have recently become exposed (about 2 days ago). I was wondering if anyone had any experience of identifying piddocks and other rock boring bivalves in the field? Are the colour of the siphons of piddocks species specific or are they just different colourmorphs? We generally id Hiatella arctica as having a red siphon, and Barnea candida has a yellowy brown coloured syphon. We have come across a variety of colours such as purple, yellow, white, orange, and even white with purple tips! These have been boring into limestone. It would be great if there was some correlation, as we aren't too keen on taking spades to chunks of rock (and would not advocate anyone does this!!!). Piddocks are very difficult to identify. I've been looking at their contribution to biodiversity on shores over the last few years and have had similar concerns about taking them out of the rock - I've scoured the literature to find some other way. Siphon colours can give you some idea but as you've already found can be variable. 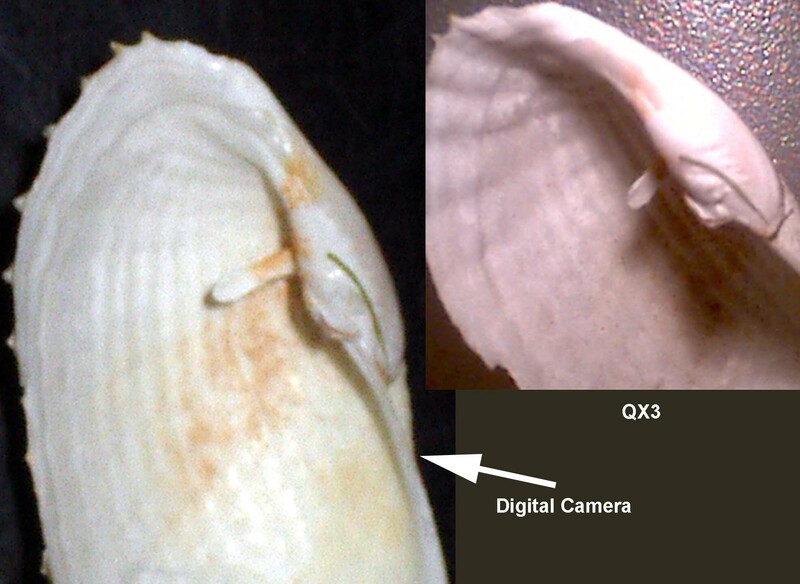 The yellowy/brown siphon can also belong to Pholas dactylas, so probably does the white/purple one you mentioned. 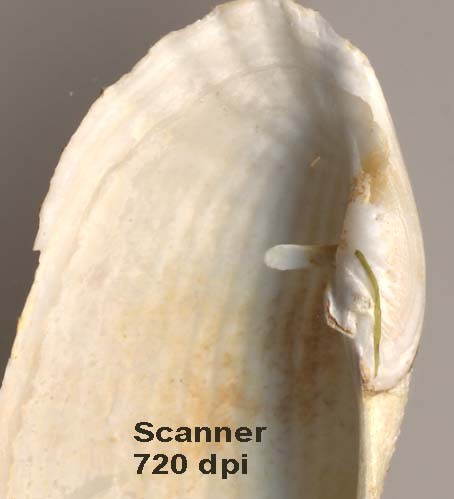 Knight (1984), a PhD thesis at London University, suggested that the species could be identified tapping the rock and looking at the thickness, range and duration of the squirt of water from the siphon to tell between P.dactylas, Barnea sp., and Hiatella. No further details are given. I have tried this without much success. The only way to be absolutely sure about the species is to look at the shells - try checking the strand line.